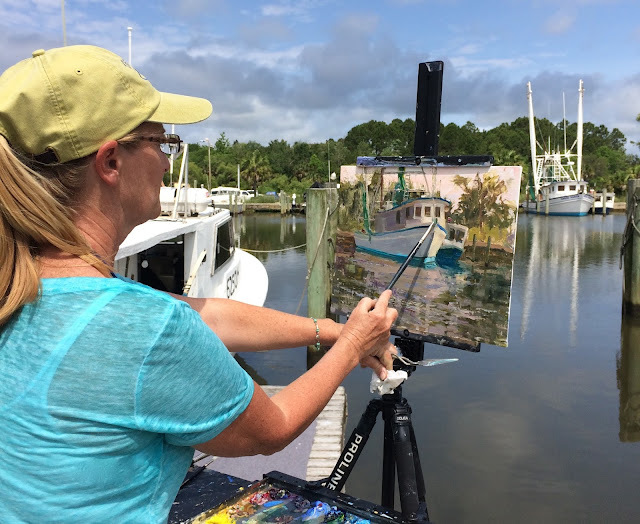 Plein Air South had it's inaugural gathering in May 2016 in Apalachicola, Florida. The influence of today's plein air painting community is priceless. It was my pleasure to host the critique segment where participants could get advice on their paintings from three accomplished and fun artists: Larry Moore (FL), Dee Beard Dean (NC), and Bill Davidson (CO). The event was formed during numerous go-to-meeting video conferences. From several states, on our laptops we shared ideas and hashed out possibilities. The intent was simple - we wanted a community style gathering, a place to enjoy the southern landscape in the company of artists who share the passion of painting outdoors. With camaraderie the focus, it is not a competition. All are welcome to participate and be inspired at this artistic celebration. Our opening reception keynote address was presented by Jean Stern, Executive Director, The Irvine Museum, CA. Like a buffet three times a day there were selections of artists at nearby venues sharing a variety of engaging presentations, painting demos, and panel discussions. The grand event closed with a yummy seafood dinner and a thought provoking address on "Authenticity" by Joe Paquet, a signature member of the Plein Air Painters of America. 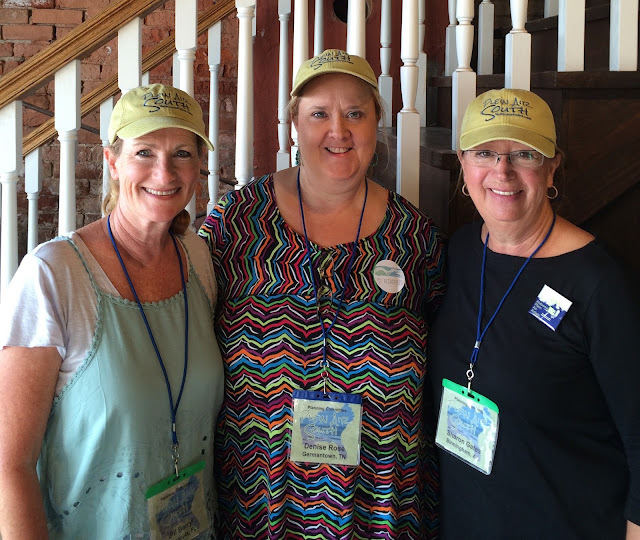 Workin' gals in our Plein Air South caps - compliments of being on the planning committee. Joe Taylor had the vision and made it happen with his community team in Apalachicola (Franklin's Promise Coalition). Denise Rose took on the scheduling and website preparation so participants could sign up on line. When our imaginings were realized and we all came together for four days, it was quite the art-party. It's a terrific value considering all the food, drink, music, and art on tap. It follows the Forgotten Coast en Plein Air (an invitational paint-out) and is facilitated by the Forgotten Coast Cultural Coalition. Lots of creative sparks build up in the atmosphere when artists converge. If you're like me, it's imperative to get out there and compose your own memories of the scene, the day, the light. So bring your paint-gear and find a get-away between sessions. There might be something in the salty air or perhaps the fresh seafood that makes you paint better! Just a thought, anyway come join us in Apalach'. 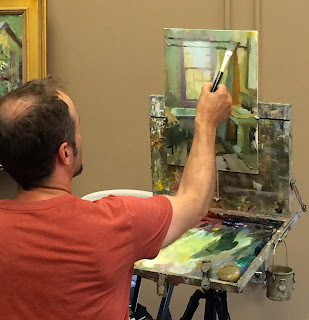 A painting, or a painting event, is what you make it. Twenty-four artists in all made up the cast of presenters. Jason Sacran, John Lasater and Bill Davidson heckling Jim Richards painting a bathroom! This was fun! Group settings are great for nocturne painting. Make plans! 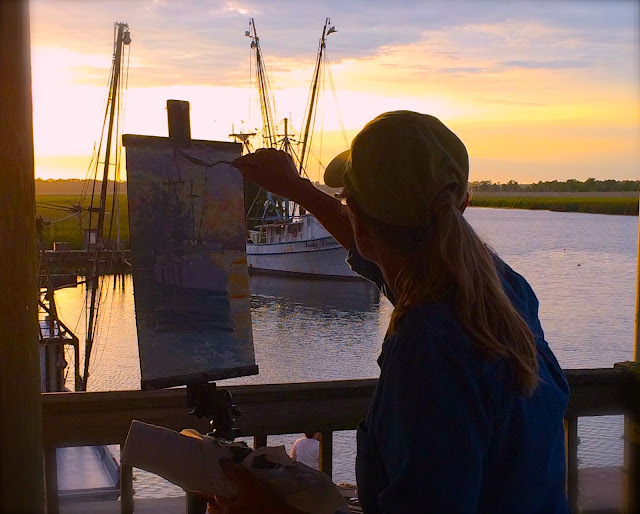 The 2017 gathering of Plein Air South is May 15-18. New info is being updated on the website: YallComePaint.com. Info "About Us" can be found on this page. Plein Air South was one of the highlights of 2016! 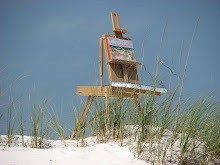 Plein Air South was one of the BEST painting experiences I've ever had. You can really talk one on one with a wide variety of professional painters, and watch them paint on site. It's an incredible experience. Oh, and the seafood...! Thanks for leaving a response ladies! We are glad you came and enjoyed yourselves. The big NEWS since this was published is.... Scott Christensen will be our Keynote Speaker!!! Hope to see you in May!